Treat your feet with a pair of Snugrugs® Sheepskin Slippers. We have a fabulous collection of women’s in a wide variety of colours and sizes. Our own brand slippers, made in the traditional way either by traditional moccasin construction or stitched and turned with a cemented sole. Each pair gloriously comfortable as only a pair of real sheepskin slippers can give you. Snugrugs stocks a huge range of sheepskin slippers using the finest hides available. We also sell a full range of wool lined slippers and they are slightly cheaper. Sinking your feet into a pair of our fully fleece lined slippers feels like they are being cosseted in luxury. Just like walking on air! Our 100% genuine sheepskins are ethically sourced, bringing with them a host of health benefits. The fibres have microbial properties and your feet are allowed to breathe naturally. There is no better material for allowing the air to circulate around your feet. It allows them to remain dry while any moisture created simply wicks away naturally into the air. The traditional handmade sheepskin slipper has been around for centuries. Cut and stitched in the only way available. Modern manufacturing techniques make the process quicker because of machine cutting and modern technology. The traditional method of hand stitching the uppers has remained. Many of our slippers feature soft soles. The upper is hand-stitched on to a lower part which wraps under the foot to act as the sole. Repeated wear toughens the fibres making the soles more durable every time you walk on them. We also have a hard sole slipper collection which includes many of our including mens styles. These allow for more wear underfoot. Other collections feature cemented soles which can be worn for brief periods outside. These are more like sheepskin house shoes, the old name for slippers! Read more. 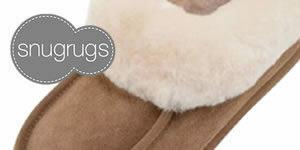 Snugrugs is continually developing the ranges of sheepskin slippers & boots on offer so please bookmark our page. Remember us when you need that special gift or would just like to spoil yourself!